The scene of the shooting today. THREE PEOPLE HAVE been injured, including one baby, in a shooting incident in west Dublin. Gardaí responded to a call of a shooting at Parlickstown in Mulhuddart at around 12.30pm today. 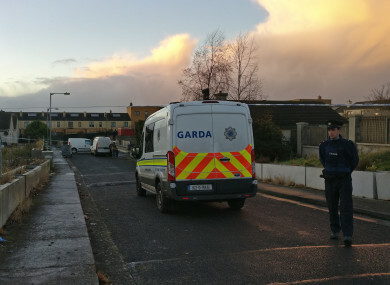 Upon arrival, gardaí discovered a 17-year-old male with gunshot wounds. A woman in her late 20s and an eight-month-old infant were also found, both with gunshot wounds. Gardaí confirmed that the baby suffered injuries to lower body during the shooting. The woman was holding the baby on her right hip when both of them were struck, gardaí told reporters at a press conference this afternoon. All victims have been removed to hospital. Their conditions are not life-threatening. Gardaí have launched an investigation into the shooting. A male has been arrested on suspicion of possession of ammunition under Section 30 Offences Against the State Act. He is currently being detained at Blanchardstown Garda Station. TheJournal.ie understands that a man approached the house and fired a shotgun at the young man. Officers have sealed off the area and a forensic examination will be carried out. Speaking to reporters in the area of Parlickstown, Arthur Collins – the grandfather of the baby who was shot – said he was devastated by what had happened. “I’ve never seen nothing like it in my life for to shoot a… baby child,” he said. That has to be to lowest of the low. I’ve never seen or I’ve never heard anything like that. Anyone who was in the vicinity of Parlickstown at around 12pm that witnessed a car driving at high-speed, or that witnessed suspicious behaviour is asked to contact Blanchardstown Garda Station on 666 7000. Email “'This is a very volatile situation': Baby and teenager injured in west Dublin shooting”. Feedback on “'This is a very volatile situation': Baby and teenager injured in west Dublin shooting”.